One of the odd things about going through cancer (or any major life-changing event), is the “I feel so alone” problem. Family, friends, caregivers and doctors can do an enormous number of things. They can be there to help emotionally, physically and spiritually. But there is one thing that most of them cannot do (THANKFULLY) and that is to know exactly what this experience is like. This gap seems especially wide with rare diseases like appendix cancers, where there are only 500 – 1000 cases diagnosed each year in the U.S. There just aren’t that many of us around. So one of my reasons for writing this blog, besides being therapeutic for me, was to connect with other appendix cancer folks. I’ve been lucky to have found some friends through their blogs (Dan, Mark), through my blog (Randy, Karen), in the hospital (Val, Jim), through friends (Owen), through a mentor program (Becky) and by just scouring around on the internet. Karen (who I haven’t met yet but who found my blog a few weeks ago) is the first person I know that has my same diagnosis of non-mucinous colonic-type appendiceal adenocarcinoma. Wow! Finding these people has been so good for my head. 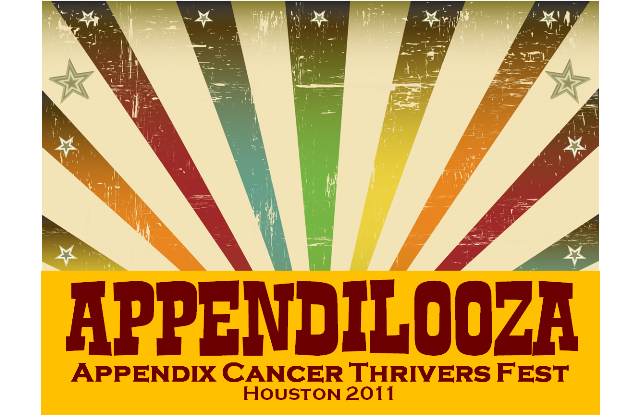 And it was especially fun to join up with a bunch of folks at the first-ever “Appendilooza” Appendix Cancer Thrivers Fest this week. The Appendilooza idea began when Sheboygan Dan was scheduled to come down to M.D. Anderson Cancer Center this week for his check-up. Since I’m just a few hours away, I couldn’t pass up the opportunity to drive to Houston and meet another appendix cancer thriver in person. Dan has been a touchstone for me since I found his informative blog in October 2010, so I was thrilled when he agreed to meet at MDACC. Yay! I offered to introduce him to Randy, who lives in Houston and graciously agreed to meet even though he had just finished a FOLFIRI chemo treatment. So now it was the three of us. But someone was missing – Val! Val and I met the day I was discharged from MDACC after my big surgery in November 2010. Her parents found my blog right before my surgery and told me about her surgery, which overlapped my stay in the hospital. Good timing! A few months ago, I drove down to MDACC to see Val for her quarterly check-up and introduced her to Randy as well. Val was determined not to miss Appendilooza, so she flew all the way from Kansas City to complete the party. What a trooper! And that is how Appendilooza was born…complete with t-shirts! We had some made up for ourselves as well as our doctors and P.A.s. Too much fun! 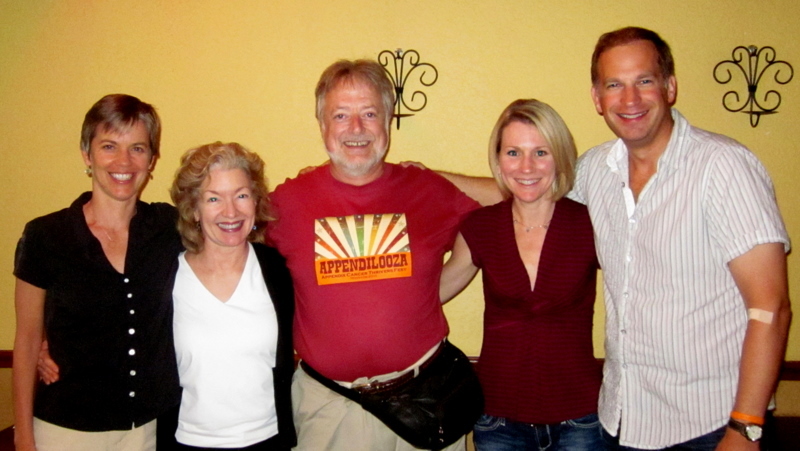 Appendilooza 2011 Thrivers: Ivanna, Caroline (Randy’s spouse), Randy, Val and Dan. It was actually quite stunning for me to see everyone. These incredible people, who I have known individually for some time, were now altogether in one place! We shared scrumptious pizza and wine. We talked, laughed and talked some more. Personal stuff. Down and dirty. Things only members of the appendix cancer thrivers club can talk about. Shared our battles with our various flavors of appendix cancer (PMP, signet ring cell, non-mucinous colonic-type), our surgeries, our recoveries, our after-effects. Talked of our pre-cancer lives, our families, our relationships, our doctors, our lists of missing body parts. Shared coping strategies that work and don’t work. Talked about navigating time with the blessing of altered perspective. Hopes, fears, joys. About enjoying NOW. Finally, we had to say goodnight. Dan had an early appointment to “get the news” about his quarterly CT scans from his doctor the next day. We were all nervous since each of us knows what these post-testing, pre-doctor periods feel like. Limbo land. That “waiting for the news” pause is no small thing. But the news was good – Dan is fine. We decompressed for a bit and then said our good-byes as Dan and Val headed for the airport to catch their flights back home. I showed my daughters the picture of our small group. They both commented on how happy we all looked. I told them that’s how it feels when people are there for each other. We don’t know when we will be together again. We just had to grab this opportunity to get together and run with it. But we are rooting for “Appendilooza 2012” in Sheboygan! And hopefully, our crowd will double and include Sheboygan Mark, Karen, Becky and Jim and more next time. Appendilooza 2011 was good for my soul. This entry was posted in cancer by Ivanna. Bookmark the permalink. Wonderful posting on your blog. We are so glad that Valerie was able to join the group earlier this week. The photograph is equally wonderful – it’s so nice to see all the great smiles. We are glad that Val was able to meet Randy and his wife and, of course, it was great that she was able to be with you again and meet Dan in person. She showed us the t-shirt yesterday and told us about her trip. This is so wonderful to read, this gathering of appendix cancer survivors. The girls are right. The whole group of you really does look happy. So happy for you! You look beautiful! You all do!